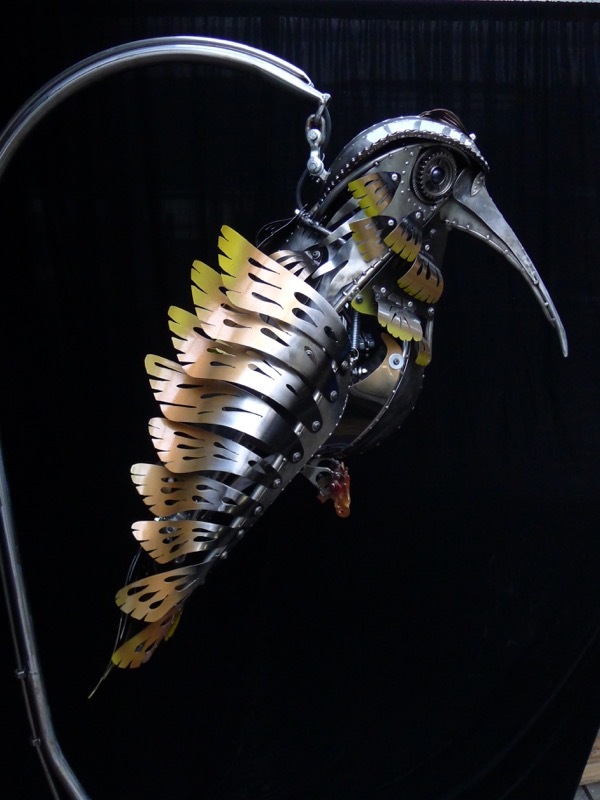 "Jack" is a kinetic sculpture inspired by a hummingbird (4 ft x 3ft x 4 ft). 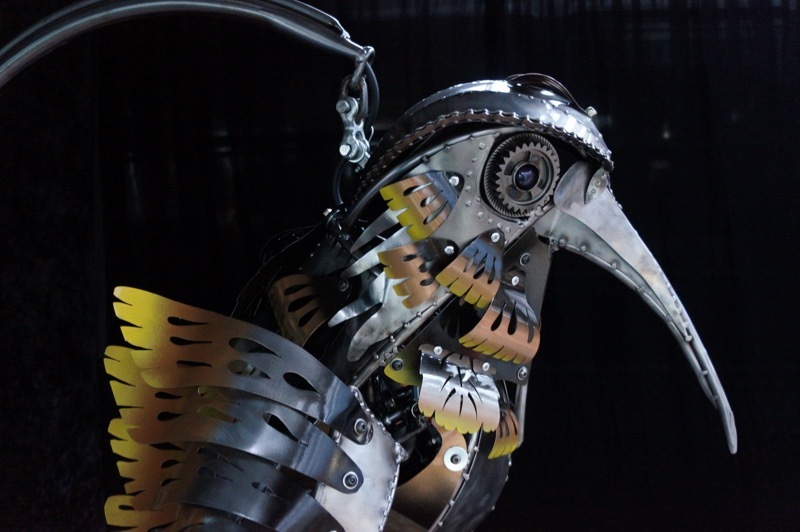 He is made with hand cut and formed steel, salvaged coffee machine and bicycle parts, two (2) motors, and a small light inside his head. His wings move through the use of two motors. One of the motors is connected to linkage that also makes the tail move from front to back. I had been contemplating trying something new for my next piece and had decided to create a hummingbird. Interestingly, during my design phase, a family member shared a link to a live feed of a hummingbird who had built her nest on a dangling network cable at the UofA. As I worked on this sculpture, I tuned in many times to check on the eggs/chicks - named Jack and Jill by the UofA. I happened to be watching the live stream when Jill left the nest. I fretted for Jack, who precariously clung to the nest for a few more days. 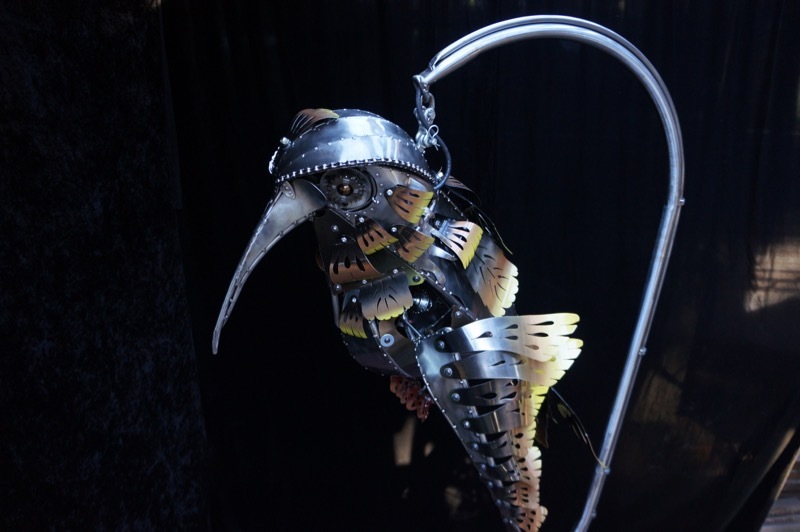 When I learned that he had successfully left the nest too, I decided to name this piece in his honor.